The X-ray portering chair can reduce patient handling in busy Accident & Emergency and X-ray departments to a minimum. By allowing clear access to the patient by folding down the back and lowering the arms, transfer from the chair is often unnecessary. This innovative design does not restrict the options usually available on Bradfern porter chairs such as telescopic leg-rests, I V pole and seat belt. This porter wheelchair is highly manoeuvrable, mounted on 315mm wheels with puncture proof tyres at the rear, and hardwearing 100mm castors at the front. 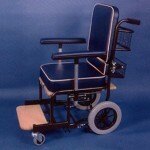 The chair comes complete with a foot operated brake system and large storage basket at the rear.